A bit of a late start today, but every time I sit down to get to typing I'm summoned away. I'm excited to say a bunch of holiday stuff arrived, which you'll be seeing soon. I though it was the end of holiday bits, but I thought wrong. 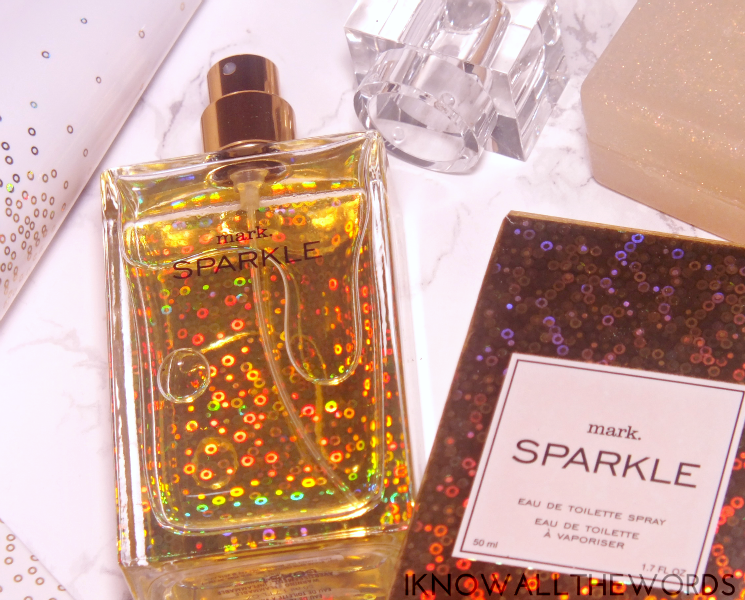 Continuing on with said holiday bits, the very glitzy Mark Sparkle fragrance collection. From the eau de toilette, body lotion and soap it's a full on sparkle fest. How festive, right?! Read on for a closer look. 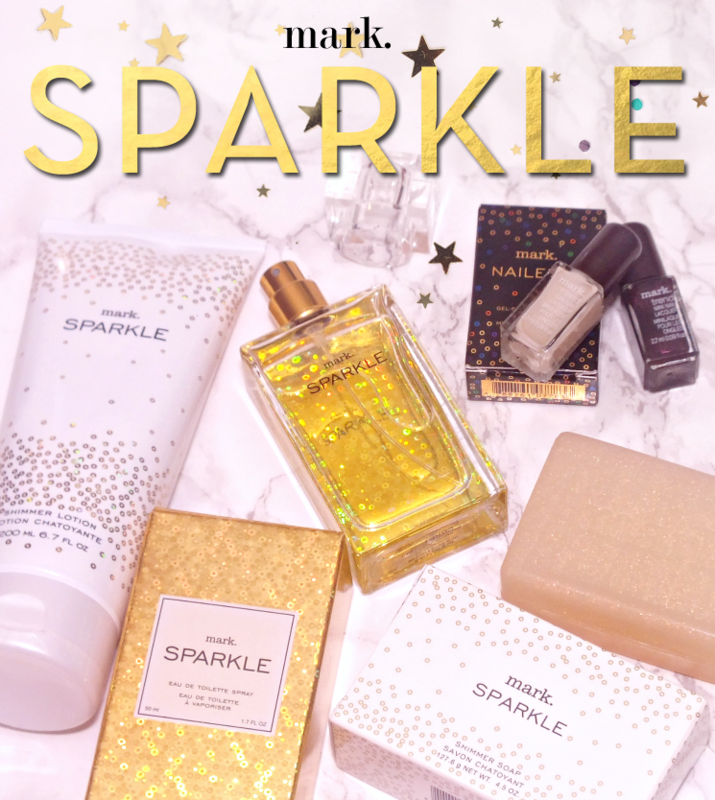 The star of the Mark Sparkle collection is the Sparkle Eau de Toilette. The bottle is simple in shape, but clad in super sparkly gold foil. The foil has a holographic effect that flares rainbow hues in the light for full on sparkleosity. The scent combines strawberry, pink jasmine, and chocolate essence (yup chocolate.) It sounds like it might not work, but the notes come together to create a playful fruity scent that is quite nice. It's light, with a sort of effervescence and a bright sweetness without the cloying effect. To layer up the scent, there is the Shimmer Lotion and Shimmer Soap which both have the same Sparkle scent. The lotion give skin a nice does of hydration and scent with the addition of fine golden shimmer. The soap is filled with golden shimmer as well, but I don't find much (or any) stays on the skin after use. 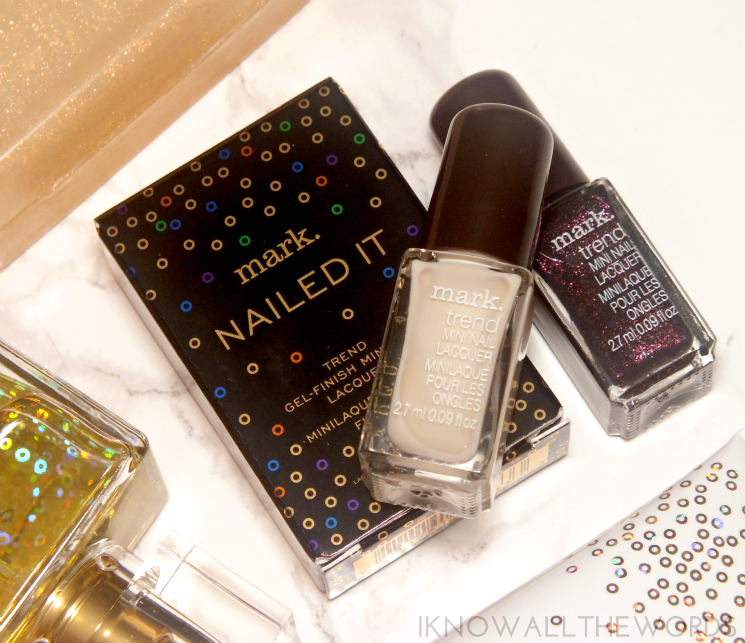 The Mark Nailed It Trend Gel-Finish Mini Nail Lacquers aren't officially part of the Sparkle collection, but are included in the Mark holiday offerings. The minis are said to provide enough polish for ten manicures and have decent brushes for such small bottles. This duo has a new formula for Mark, as these are gel-finish (ooh, fancy!) I didn't find any difference in application, but the finish is in fact super glossy and feels more durable than the normal range. The holiday shades include Eggnog and Sugarplum. Eggnog is a beige-cream cream. I love the colour, but the shade is a bit sheer and required three coats to be fully opaque. Sugarplum has a blackened plum base filled with red-gold shimmer and glitter. The shimmer is slightly hidden, but gives the base an inner glow. Unlike Eggnog, only needs two coats. Overall, some great options from Mark. I didn't expect to love the Sparkle scent, but it's fun and light and a nice change. What do you think? Interested in any of these products?